Get your paper or electronic copy now by clicking on the title. Today Daddy and I went to a 4-H Club meating, I signed up for Horse Club. Neil was there too, but he signed up for Rocketry. We had about 1,000,000 blanks to fill in with all sorts of dumb questions and answers. Mrs. Alen is the leader of Horses. She is our neighbor. I have the pet pigoens Ashes and Charcoal and Vanala. Ashes and Charcoal are both blue-gray but I can tell them apart because Charcoal has a little bit of white in the very back in between it’s wings (drawing) and Ashes doesn’t. Vanala is easy to tell apart from the others in fact if someone couldn’t I think there crazy, because Ashes and Charcoal are blue-gray and Vanala is white. Today we only had a haulf a day of school. And so Roger and I went fishing Roger caught a bass 16 inches long (drawing) and 4 inches wide (drawing). The fishing was souper! This is a trout that I caught in my uncle’s pond. 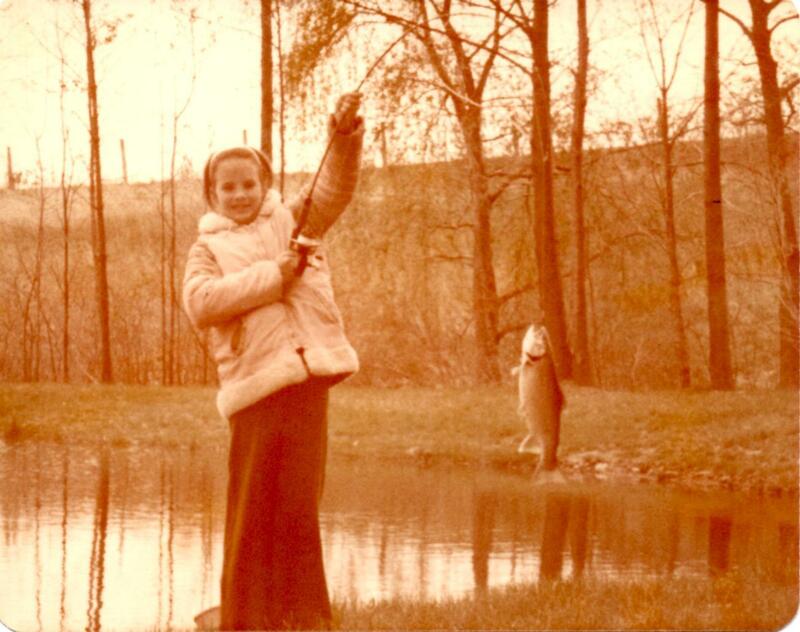 At 10 years old I was very enamored of fishing! The book is out, available from Amazon.com or if you buy it directly from the publisher, eLectio Publishing, you get a free e-book with the purchase of the paperback! AVAILABLE TOMORROW from eLectio Publishing. Today I went fishing and the Hope’s came down fishing. One time Roger stole some boards from our club house in the barn and I told him when I got Kristen Hope around hear we’d fix It up. Well Kristen and I went to get our boards back and when we got them there was an open space in the roff of Roger’s hey fort so I went to lower my-self down into the hole. A board broke and a hey bal fell but I was all right. The fishing was great! I cought a lot of fish, first I was fishing for bass but no luck (I used a fishing-fly for the bass). And I decided to fish for sunnys with worms and that was great! I threw in my line and about 5 sec. I got a bite. It was fun. Today we were at Grandma Brubaker’s house all day. I was so hot I felt like I would die (inside). Then I went in Grandma’s room and took my dress of and layed on her bed for a while. I had a good day! Today I fixed up our clubhouse so it was safe. Then I sweept our clubhouse and when I was half done I had a pile of dirt ½ foot high ½ foot long and ½ foot wide. We went to get icecream cones. We watched Little House on the Praire. And Revren Alden got mairied to Anna Craig. Mrs. Olsen tried to stop them from getting married but she didn’t do very well. 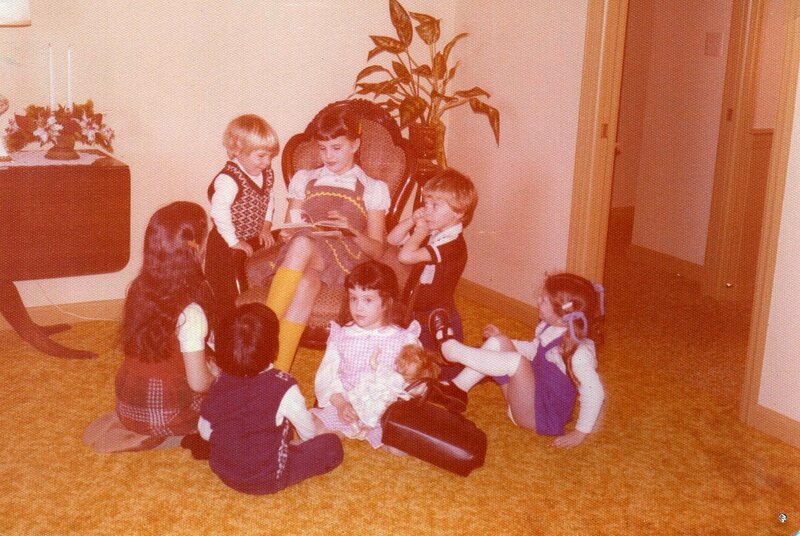 Me reading to my cousins–apparently either before or after I over heated. Find the whole story at eLectio Publishing’s website tomorrow and soon after on Amazon.com. I received an invitation to write a guest blog post for Women Writers, Women’s Books. This is the first invitation I have received to write a guest blog post and I am highly flattered. I don’t know exactly why they invited me–my book isn’t even technically out yet–but it made me feel like a room without a roof to be included among the writers on this site. “The fabulous thing about these diaries is how raw they are, how badly written, how true and unpretentious. Like notes to self, written a long time ago so that I might not forget. That’s exactly what they are. As I read them, I realize how much of my own life I have forgotten. They take what was mine, what I have lost, and bring it back to me. coming next week from eLectio Publishing. Today in school I was sitting in my seat doing my work and Neil came up to me holding a book and said “Do you like books?” And I said “yes.” And he layed a book on my desk and told me I could read it, it was called The Ghost On Saturday Night. I said I would take it. Today we didn’t have any school. So we went to Grandma Zimmerman’s house all day. I rode her Big wheel and I played with a thing that looked like this (in the journal follow three attempts I made to draw it). And you hit the bottem up and a ball poped out like this (another drawing) I got 100 caches and 6 misses. Today in the morning I heped mommy clean. Then mommy boiled 12 eggs and we colored them. We boiled them so the colors dind’t run. We hid them then. It was fun. 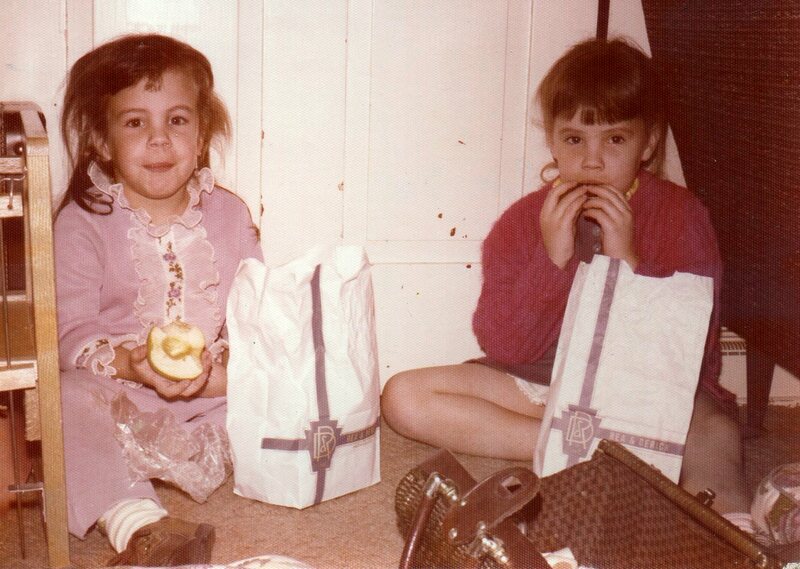 Our mom would pack “picnic” lunches for Wanda (left) and me (right) in paper bags from the drugstore and we could eat them where ever we wanted. It looks like time we are in the living room on the floor beside the couch, pre-carpet era. coming in two weeks from eLectio Publishing. Tonight we went to Bob Brubaker’s house his boy Bobby is in my school class Bobby’s big sister is in 4th grade she is the most beauitiful and mannerly and creative and kind person I ever saw. Her name is Karen. We had loads of fun we colored Easter eggs when they where boiling hot. Karen’s mother boiled the eggs then she boiled thee eggs in inion leaves they got a pretty rust color. Bobby didn’t feel good tonight. Today I felt so bad becaous Kristen Hope asked Neil if he liked me and he said “Who do you think I am? I don’t like the kid hardly.” Yvonne got her birthday presents a day eairly I gave her a coloring book crayons 4 marbles and a little piece of my tablet. Yvonne got a Big Wheel from Mommy and Daddy. I am going to go to 4-H this summer I am going to tak Horses and Pet Care. 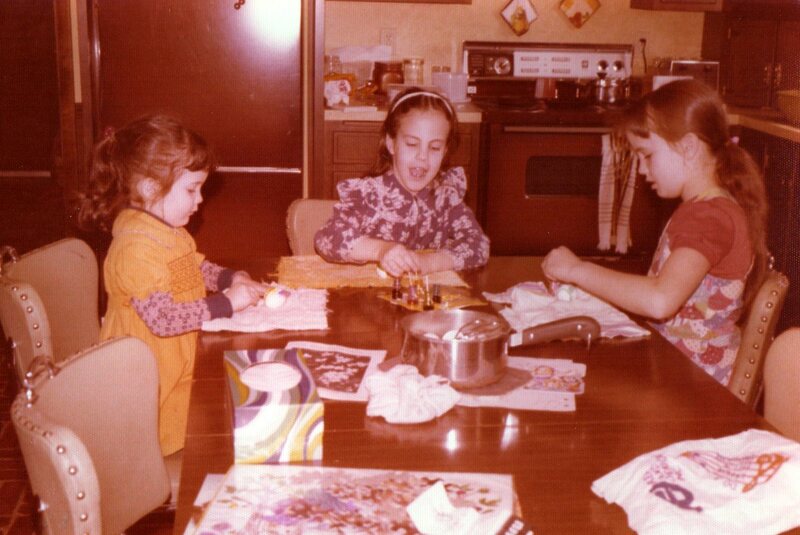 Left to right: Yvonne, Wanda and me coloring Easter eggs that year in the kitchen.